www.barrettformayor.com There are a number of ways to bring people together to discuss issues and resolve problems. Community residents must be actively involved in the planning of commercial corridor revitalization. City government can do a much better job of notifying residents and encouraging people to participate. I will work with Police Chief Hegerty to develop and implement a police-community relations program that would address issues at the district level. Area residents will work with district captains in developing agendas and identifying meeting places — parks, churches, schools, and police stations — within a particular district. I am very interested in exploring a program like the one started by Bob Knight, the former mayor of Wichita, Kansas. He introduced “community circle” discussions to address ethnic and racial differences as well as community issues. The goal was to begin building solutions based on common strengths. In Wichita, 14 community circles were formed throughout the city. Meetings were held in churches, schools, bookstores and other common ground anchors. Participants agreed to attend six sessions moderated by a trained facilitator. At the end of the sessions, all 14 groups came together to discuss strategies. During my first few months in office, I will invite ministers and community leaders to discuss a community circle initiative and other ideas. The best ideas for moving forward will undoubtedly come from the community, not from City Hall. I believe that together, we can generate enough interest to proceed with a community-wide dialogue, and we can begin to forge new and deeper relationships that will result in positive change. www.bobotformayor.com Ethnic diversity is one of the strengths in Milwaukee. Presently, many of our neighborhoods have a distinct ethnic flavor to them. As mayor, I want to highlight our ethnic diversity with neighborhoods having ethnic identities rather than just names. Imagine residents and visitors being able to spend an entire day in a Milwaukee neighborhood experiencing a different culture. Through careful planning and development, a cultural neighborhood theme has the potential of becoming an attraction. www.clarke04.com Improvement of communication and cooperation for all of Milwaukee’s communities, ethnic groups, and leaders must occur. I will immediately change the disconnected culture that exists in City Hall and vital city departments so that citizens and neighborhood leaders become more involved in the government which they pay for. My vision for Milwaukee includes all neighborhoods, all citizens, and all those who believe we can once again become a great community. Neighborhood associations, faith based groups, and not for profits should coalesce for the common goal to move Milwaukee forward as one. For too long this city has been governed by a select few. The back door has continuously been left open to special interests while the front door has been locked to you. Business as usual will end once I am elected. Let’s ensure that everyone is allowed to discuss and act upon matters that face the entire city such as safer streets, better education, and lower taxes. It will take comprehensive and generous commitment from everyone if we are to bring back social, communal and economic vitality to the area. www.onemilwaukee.com I will lead by example. I am an African American that resides on the Eastside of Milwaukee and serves as President of the Board of the Latino Community Center on the Southside. On my campaign team there are volunteers who are Hmong, Chinese, Latino, Black and White. Every Friday, my campaign holds an event called “Fridays with Frank.” We pick an establishment in a different part of the city and visit with the patrons of the establishment. On Friday, January 23, we (were) at Tracks in Riverwest. Cameras, journalists, and stakeholders follow the mayor just about everywhere he goes. As mayor, I will hold high level meetings in the neighborhoods and while I am there I’ll draw attention to all that’s good about that neighborhood. I will take every opportunity to request that every citizen of Milwaukee visit a city neighborhood that is ethnically different from theirs. I will also encourage leaders in the neighborhoods to host events that will attract people from outside their neighborhood. Community leaders must see their neighborhoods as products that must be sold to consumer. In order to get the consumer to buy (visit your neighborhood), the seller must market the product (tell all that’s good about it). www.sandy4mayor.com It is imperative that we, as a city, promote our greatest assets such as our diverse neighborhoods and rich cultural history. As Mayor, I will provide leadership and direction in marketing our neighborhoods and celebrating those strengths. I will provide a strategic plan that addresses revitalization goals of commercial districts, housing development, schools and green space in our neighborhoods. It is necessary in order to concentrate our efforts and direction in planning. In creating this strategic plan, I will bring community groups, residents, and city departments to the table. I will promote and support community based newspapers such as the Washington Heights HighLighter, Riverwest Currents, Washington Park Beat and the Sherman Press. These publications provide a wonderful outlet for neighborhood information and networking. They connect people to their communities. I will provide some financial assistance to them using Block Grant dollars. Recreating smaller commercial districts with an eclectic mix of small businesses and fostering a climate of entrepreneurship will draw the many talents and resources in our communities. This will strengthen neighborhood’s identities and add economic value. 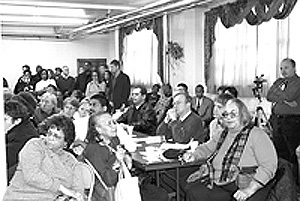 www.jones4mayor.com (phone interview) We certainly are an ethnically diverse city, and we have historically had ethnically-defined communities. Although there has been talk about inclusiveness and valuing diversity from elected officials, I don’t think that actually, except in some areas of the faith communities, we have reached out and honestly and earnestly attempted to bridge the gaps that seem to separate us. As Mayor, I would truly make that effort at every level. That has to happen by starting at our most basic organizations — block watches, community-based organizations, faith communities, government itself — even the way we handle our community block grant money. Municipal government could and should be very much involved in dealing with the issues of racism. That’s really what we’re talking about — racism and ethnic bias, and I certain feel there’s a role there for the Mayor’s office. Racism is something that’s historically entrenched and it can’t be done overnight. I don’t think that city government has really truly, at a grassroots level, attempted to do that. I would go into the neighborhoods and have an honest discourse with the community. Those individuals who are truly interested in bridging the gaps that separate us, in looking at the commonalities we have, those are the people that I would work with. I would also ask other agencies in the city government to work with those individuals at bringing about racial inclusiveness and attempting to insure that private sector and financial institutions are equitably and fairly dealing with loans and being involved with the community. We have legislation that outlaws almost every form of discrimination, but what we need to do is to pinpoint areas where those things are not happening and have an honest dialogue about it. Issues like this can’t be dealt with at 200 E. Wells, we need to go back to the community in every neighborhood, and the Mayor has to bring the influence that the office carries to deal with these issues honestly. www.tomnardelli.com Milwaukee’s population is a rich ethnic tapestry that gives our city its unique character. Tourists to Milwaukee may have the greatest appreciation for that tapestry, impressed as they are by the ethic flavors of our restaurants, festivals, visual and performing arts…even the architecture of our buildings. We can take a tip from our visitors and support cultural outreach programs in our schools. Helping neighborhoods to a similar appreciation of our diversity won’t be easy, but there the mayor must lead the way. As mayor, my administration will be characterized by inclusion, with my staff reflecting Milwaukee’s ethnic diversity. I will encourage and support the work of grass roots groups to increase the safety, stability and livability of their neighborhoods. Specifically, developing an outreach to these groups that will help them obtain block grant funds and implement successful programs. I will also discourage urban development that exacerbates the problem of urban sprawl. Instead, I will promote the development of neighborhood business centers that offer people retail, grocery stores, city services and more within easy walking distance. Getting people out of their cars and bringing them together in neighborhood centers will foster a sense of fellowship among the diverse members of a community. www.pittaformayor2004.com I grew up in the Sherman Park neighborhood. I currently live on 31st and Kilbourn, a couple blocks from Merrill Park. I have many friends and family that live in the Riverwest area. I feel very connected to all three of the most ethnically diverse neighborhoods that you mentioned. I would fight to make progressive changes to Summerfest and the ethnic festivals at the lakefront. My first move would be to promote the hiring of a young minority to take the position that Bo Black held. I would fight to make the festival more attractive to young people and families. I would bring back the rides, dance tents and bring more diverse acts that our youth community would enjoy. I would also fight to lower the costs to bring it back to what it once was, a fun family festival. I would change the focus of economic development to the neighborhoods. I would promote more outside cafes and public places for people to just sit, talk, and people watch. I would be visible throughout the community. I would put an emphasis on young people being more active and healthy, which begins with more walking and less driving. www.marvinpratt.com In my inaugural remarks on January 2, I made a call for unity throughout the city by declaring my first day in office as Unity Day. That proclamation was addressed to the leaders of MICAH, the Milwaukee Inner Congregations Allied for Hope, and to all the other religious leaders in the greater Milwaukee area. By proclaiming that day as “Unity Day” throughout the city, I asked religious leaders from all faiths to enlist their congregations in the effort to build a spirit of understanding, tolerance, and unity among all the many different ethnic and religious populations in our community I asked them to join the effort to overcome the barriers that have separated us… and to build a new future for us all. I believe the mayor can use this office as a bully pulpit, to act as a unifier, to bring different groups together to celebrate the diversity that makes this city a true urban center and gathering place for all racial and ethnic groups. Neighborhood economic development should begin with an equal distribution of Community Block Grant Monies. Second, CDBG grants to downtown projects should be eliminated. Downtown should have enough financing through the banking and financial communities which stands to benefit directly from their investment without relying on dollars which were meant to help largely underdeveloped areas and poorer neighborhood groups. A lot of the disconnect stems from institutional racist policies and hyper-segregation practices within our urban population driven in part by City Hall beliefs and politics. Third, we must end the fraud and political kickbacks in the block grant process. This should free up more funds for direct community neighborhood development. Fourth, drug houses must be equally and aggressively targeted and eliminated. Fifth, vacant houses and businesses should be confiscated by the city and sold off inexpensively to people who want to own a home or entrepreneurs who want to start a business. The city or private groups should provide consultants to assist new homeowners and business men and women. Sixth, city services like lighting, snow removal, trash pickup and street sweeping must be done on an equal basis throughout the city. Letting certain neighborhoods go because of biased City Hall policies is unacceptable. Compatibility stems from perception which is formed largely by the investments we make in the various communities. The primary election is Februrary 17; the general election is April 6. Need to register? Go to http://www.ci.mil.wi.us/citygov/election/register.htm. See the mayoral candidates explain their views in person. Catch them Thursday, February 5, 5 p.m., at a Human Resource Management Association and Independent Business Owners Association of Wisconsin event at Joey Buona’s Pizzeria, 500 N. Water Street. This forum will focus on issues important to employers. The same night, there is a “Get out the Youth Vote” forum, sponsored by Rethinking Schools, among several other organizations, at 6:30 p.m. at Marquette University’s Weasler Auditorium. A UWM forum is set for February 9 at 7:30 p.m. at the UWM Union, Wisconsin Room. (College Republicans host). 1290 WMCS hosts a forum February 13 at 7 a.m., and it will be broadcast live.